It was very clean and warm. The host was very obliging and friendly. Clean and comfortable and excellent value for money which is what I look for on single overnight business trips. Jeff was very accommodating. Bed was very comfy and liked that the room had a fan and came with everythingn needed to make a cup of tea in the morning. cheap & cheerful, no towel provided first two days, need painting. Very friendly staff even late at night! It has a shared toilet but it is very clean. The room was clean and warm. It was convenient to visit friends. This family-run guest house is only 2.3 mi from London Heathrow Airport; a bus service runs regularly between the airport and the bus stop just 3 minutes’ walk away. 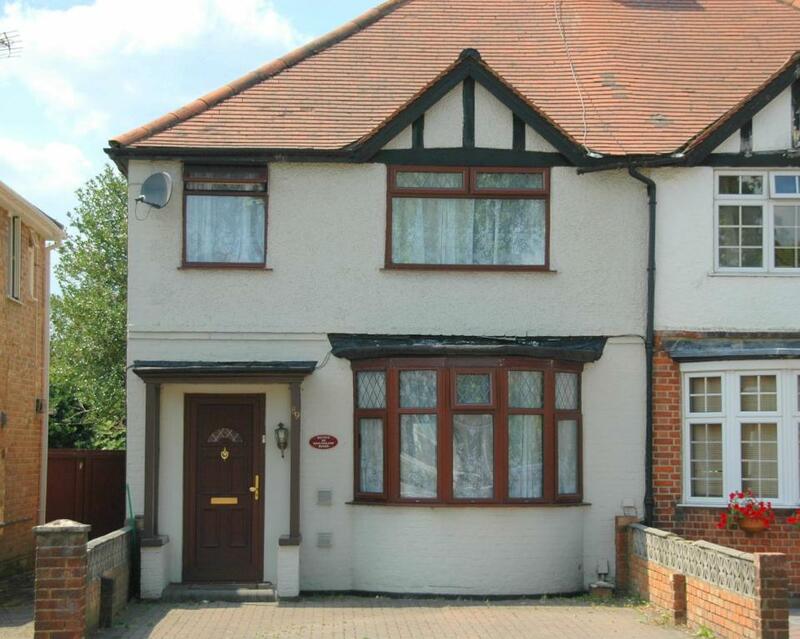 This small, budget guest house is located in a quiet residential area in Feltham, Middlesex. Free wireless internet access is available in the rooms. The number 285 and 490 busses run regularly 24 hours a day, 7 days a week, from the bus stop just a few minutes’ walk from the house. Feltham railway station is only 10 minutes’ walk away. The station offers frequent, regular train services to central London and London Waterloo station, with a journey time of just 30 minutes. Next to the railway station is Feltham’s newly developed town center, with its supermarkets, pubs, restaurants, banks, cinemas, bingo hall and post office. With a convenient location and great transport links, the Revive Lodge provides good budget accommodations for a holiday stay or for a stop-off for those using Heathrow airport. When would you like to stay at Revive Lodge? House Rules Revive Lodge takes special requests – add in the next step! Debit card Revive Lodge accepts these cards and reserves the right to temporarily hold an amount prior to arrival. Revive Lodge accepts these cards and reserves the right to temporarily hold an amount prior to arrival. The lodge can hold your luggage for 2 hours after you check-out, free of charge. Any extra times will be charged at GBP 2 per hour, (minimum GBP 2 charge). Please inform Revive Lodge of your expected arrival time in advance. You can use the Special Requests box when booking, or contact the property directly using the contact details in your confirmation. Room a bit dated but just needed a lock of paint and the en suite shower needed fixing My room was excellent but being next to the front door I ended up opening the door for arriving guests - not a real problem but late at night was not really good. When I arrived there was a card outside the front door with a number that I should call. I did this but it took some time for someone to then text me back asking me what I wanted. I explained that I was booked into the guest house I was then sent another number to call. Once inside my room was not ready. I had to sit in the hallway whilst my room was prepared and I could clearly hear that a lot of air freshener was being used. The hallway and the stairs had a very bad smell of cats to the level where it actually made me feel sick. The smell was also in the bedrooms but not quite as bad. My room had two beds side by side but at different heights. The side of the bed was covered in stains. The bedroom had a large wardrobe with mirror doors with a large crack across one mirror. The wardrobe had broken shelves and fittings and was used to store an old heater, so difficult to use for clothes. The power supply for the room was an old extension lead placed on a cupboard. When flushed the toilet in the shared bathroom made a loud noise from the pipes which would have woken everyone in the house if used during the night. All in all the decoration was very poor and the house very dirty. On the booking form it stated free parking which I needed. I message the owners to check this but was then told (after I had booked) that there were only two parking spaces and that it was first come first served, not what I expected. Convenient for where I was working. Overall good location. 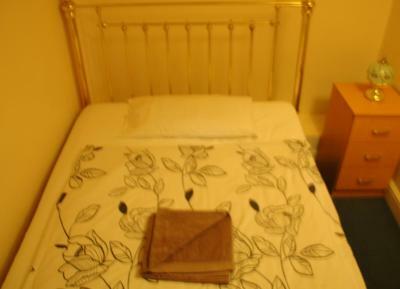 Spacious room with TV and microwave. The lodge is located far from the train station. The room had no window and the bathroom was dirty.